The Big Hole Demon is a good general search pattern that was created for the Big Hole River. My name is Dean Halse and I live in Bozeman Montana. I was looking on your website and saw you have the Big Hole Demon as one of your flies. I just thought you may want to know more about the history of this fly which was actually invented by my grandfather, Pete Narancich. Pete was a Fly Fishing activist, he owned a ranch on the Big Hole River a few miles outside of Twin Bridges. Joe Brooks visited his ranch on a regular basis to fish and he actually made a plaque for him which showcased the Big Hole Demon. Pete died a couple of years ago at age of 96. Hook : 8 10 longshank. 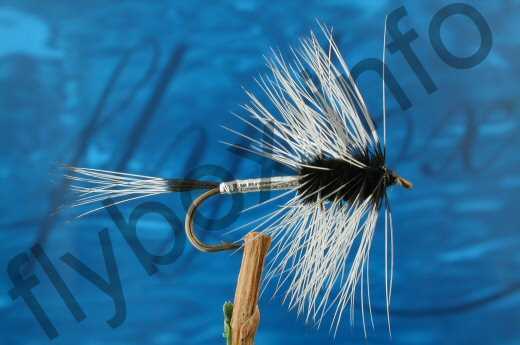 Tail : Badger hackle fibres. Body : Rear section flat silver tinsel, frontsection, black chenille. Palmered Hackle : Badger, over chenille. Currently there are no comments about the Big Hole Demon fly pattern from other fly fishermen yet.